Industries 30 Nm3/hr 95% Purity Oxygen Generator is a machine produces oxygen from air. The Air Compressor suction air from atmosphere,then the compressed air enters one air treatment part to get rid of dust,water, dust,etc, achieving clean and dry compressed air. This air treatment part mainly consists of three filters, one Refrigerant Dryer and one activated carbon oil remover. After treatment, the compressed air enters one air tank to make air stable. Then the compressed air enters PSA nitrogen/oxygen separator. After passing through this nitrogen/oxygen separator part, oxygen is collected. The produced oxygen enters one oxygen buffer tank. At the outlet of oxygen buffer tank, stable and qualified oxygen is sent to using point. 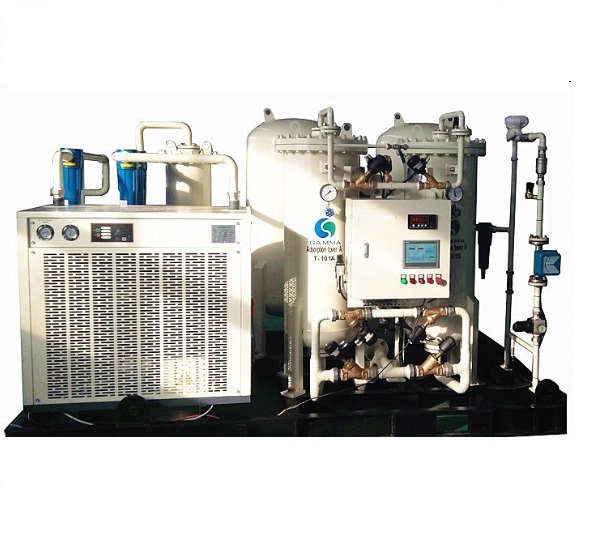 Looking for ideal Industries Oxygen Generator Manufacturer & supplier ? We have a wide selection at great prices to help you get creative. All the 30 Nm3/hr Oxygen Generator are quality guaranteed. We are China Origin Factory of 95% Purity Oxygen Generator. If you have any question, please feel free to contact us.